Stop Trump's greedy attempt to steal tips from workers! Submit comments to the Department of Labor by February 5th here! Download graphics and sample social media content here. 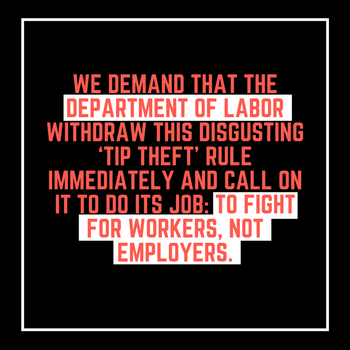 I oppose the proposed Tip Regulations Under the Fair Labor Standards Act (FLSA) regulation (RIN: 1235-AA21). This rule would go against decades of federal and state law and precedent safeguarding tips as the property of the workers who receive them, by allowing employers to take control of their employees tips. The Fair Labor Standards Act was amended in 1974 to clarify that tips are to be retained by the employee except when a valid tip pooling arrangement is in place. In 2011, the DOL issued new regulations that reinforced the FLSA and over 40 years of custom and practice by the DOL and state agencies, affirming that tips are always the property of the employee (29 C.F.R. 531.52). Tipped restaurant workers already have the lowest federal minimum wage in the country at just $2.13. As a result, they experience disproportionate rates of poverty, discrimination, and sexual harassment. The subminimum wage of $2.13 is generally not enough to cover an employee's tax liability, requiring workers to depend on tips for the entirety of their take home wage. In states with a tipped subminimum wage, workers receive their wage directly from the customer. 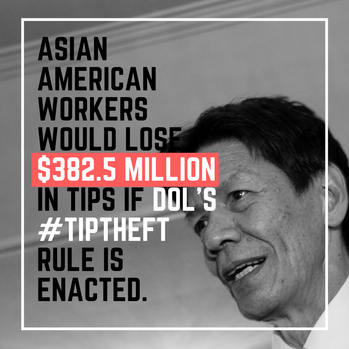 If adopted, Asian workers would lose an estimated $382.5 million in tips, and workers would lose $5.8 billion in tips every year. Moreover, shifting tips from workers to employers will fuel an increasing income gap that feeds into a cycle of poverty, economic instability, and vulnerability.